This page will outline the basic differences between indoor box lacrosse and outdoor field lacrosse. · Box lacrosse is a full contact, indoor version of lacrosse, played mostly in North America. The game originated in Canada, where it is the most popular version of the game played in contrast to the traditional field lacrosse game. It is played between two teams of six players each, and is traditionally played on an ice hockey rink once the ice has been removed or covered. 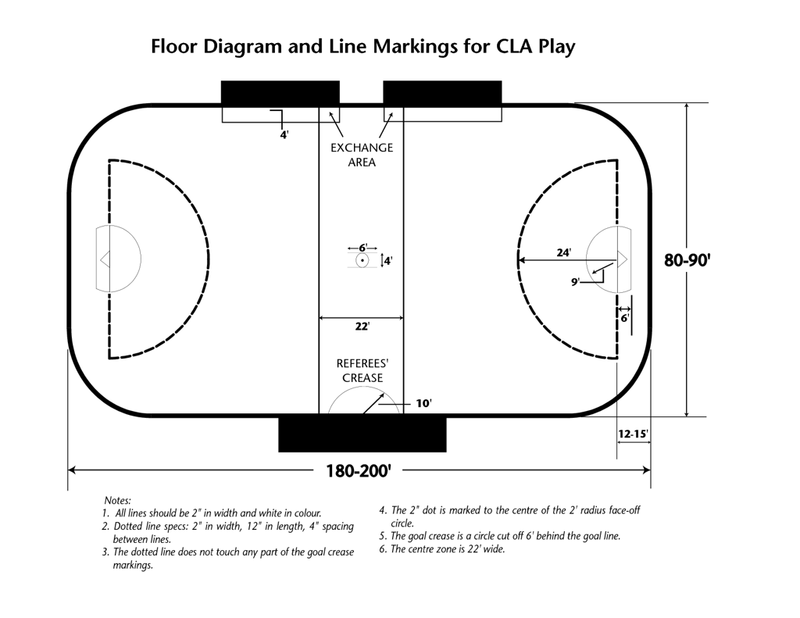 The playing area is called a box, in contrast to the open playing field of field lacrosse. The object of the game is to use a long handled racket, known as a lacrosse stick, to catch, carry, and pass the ball in an effort to score by ultimately hurling a solid rubber lacrosse ball into an opponent's goal. · While box lacrosse is similar to hockey, it is far more closely related to basketball. The offense involves full team strategy utilizing all 5 runners and there are no defensemen. The offensive players are setup as two creasemen, two shooters or cornermen and one pointman (top). The goalie sits inside his ‘crease’ which offensive players are not allowed to enter. If an offensive player enters the crease, the shot is nullified and possession is rewarded to the opposing team. · Like basketball, there is no offside or icing, but for novice kids and older, there is a 30 second shot clock. This keeps the pace of the game moving very quickly. Many penalties are similar to hockey, but lacrosse has many ‘possession’ calls instead of penalties, which keeps the play moving quickly. · Lacrosse is a fast physical game encompassing specific skills, agility, team work, physical conditioning, discipline, trust and respect. Contact is introduced at the earliest levels of play and considering the physical nature of the game and high pace, it remains one of the top sports with the least amount of youth injuries, ranking far behind hockey, football and basketball. Field lacrosse is a full contact, outdoor version of lacrosse, played with 9 runners and a goalie. Field lacrosse is the fastest growing game in North America at every level. The appeal? It's a neat composite of other sports, it's fast, extremely athletic, and it's cool! As parents discover that field lacrosse is more exciting than soccer (Zzzzz...), cheaper than ice hockey ($$$$) and not as dangerous as football, the game is getting a closer look. There are 10 players on the field; 3 attack, 3 midfielders, 3 defence and a goalkeeper. Substitutions are done on the fly, mostly for the midfielders, who play the entire length of the field. 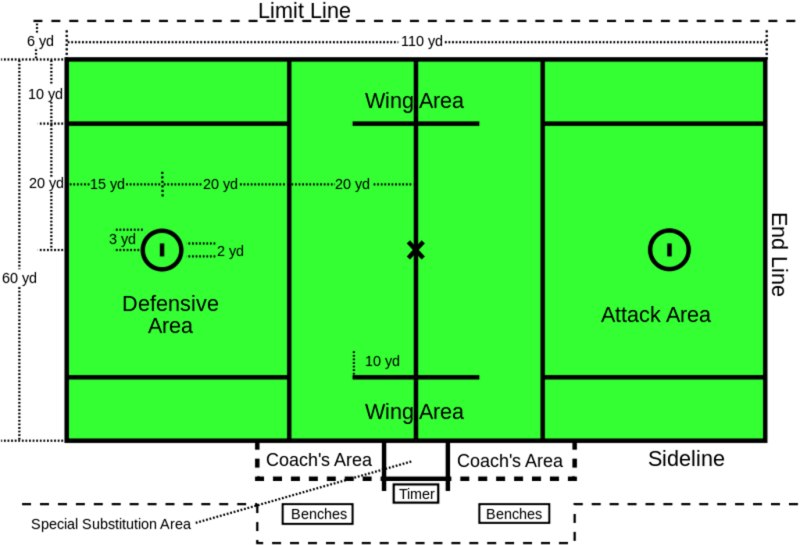 Attackmen will generally remain on the offensive half of the field while the defensemen (long poles) will remain on the defensive half. Players may exchange postions as long as another player remains in the area as a temporary replacement. Unlike box lacrosse, there is no time requirement to take a shot, so the team can maintain control of the ball for as longs as they want. Players who have played box lacrosse will find field lacrosse very different. The essential skills such as passing, catching and shooting remain similar, but the level of contact, game rules and strategy are very unique. As players discover their uniqueness, they develop into role players and learn to find positions on the field where they are most effective. Goalies and face-off specialists are an example and become designated early in their career.